Enamel, Ceramic - Enamel, over cast iron or steel, is a popular material for kitchen and bathroom sinks. Heavy and durable, these sinks can also be manufactured in a very wide range of shapes and colors. Like stainless steel, they are very resistant to hot or cold objects, but they can be damaged by sharp impacts - and once the glass surface is breached, the underlying cast iron has a tendency to corrode. Aggressive cleaning will dull the surface, leading to more dirt accumulation. 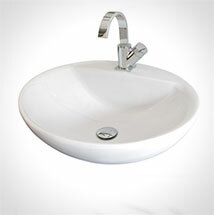 Ceramic sinks possess many of the same qualities as enamel, but without the risk of surface damage leading to corrosion. Plastic - Plastic sinks are generally inexpensive sinks, and are simply injection-molded thermoplastics. These are often deep, free-standing sinks used in laundry rooms and subject to damage by hot or sharp objects. High-end acrylic drop-in (lowered into the countertop) and under mounted (attached from the bottom) sinks are popular, and may also be made to form "solid surface" countertops. These sinks are durable, attractive, and can often be molded with an integrated countertop or joined to a separate countertop in a seamless fashion. These sinks are subject to damage by hot objects but damaged areas can sometimes be sanded-down to expose undamaged material. Stone - Stone sinks have been used for most of recorded history. Some of the more popular stones that are suitable for us, include; Marble, Travertine, Onyx and Granite. Glass, Copper, Concrete and Terrazzo - Glass, concrete, and terrazzo sinks are usually designed for their aesthetic appeal and can be obtained in a wide variety of unusual shapes and colors such as floral shapes. Concrete and terrazzo are occasionally used in very-heavy-duty applications, such as janitorial sinks.